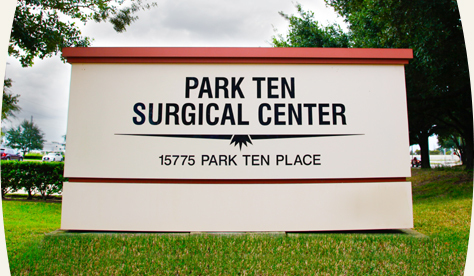 Park Ten Surgical Center is an 18,000 square foot facility that houses four operating rooms and two procedure rooms. We are a surgery center in the West Houston area that offers the convenience of being close to home without the hectic drive to the Medical Center, including free parking . Our Center has a highly trained, friendly staff and the most advanced medical equipment as well as skilled surgeons and anesthesiologists. One of the many features our patients appreciate is the Bair Paws patient controlled warming gowns they wear throughout their stay. We also have AccuVein for use on difficult IV insertions, making for a better patient experience. Our pediatric patients love the stuffed animals they receive upon discharge, and the kid friendly environment. is subject to electronic disclosure. Please review our Notice of Privacy Practices for electronic disclosures of PHI that do not require your authorization.